This magazine floor stand is a rotating stand, making it easy for visitors to access brochures no matter where they stand! The spinner base is made from metal and using aluminium fitting to secure the beautiful clear acrylic shelves to the the unit in a modern manner. These literature displays are dual-sided, maximising space by offering lots of options without taking up room on the floor! The unit is made from 5mm thick clear acrylic on the sides, with each pocket made of 3mm thick acrylic to help keep costs down whilst still offering a sturdy unit! The unique zig-zag design of the pockets is definitely an eye-catcher. 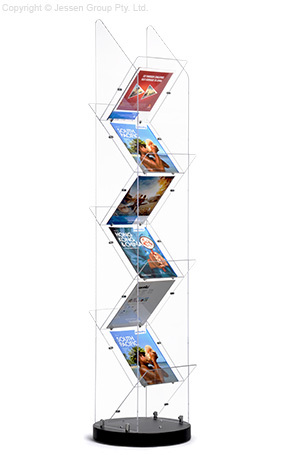 The magazine floor stand, like brochure racks and catalogue holders, is designed to hold sizes up to 280 x 280mm, including A5 (210 x 148mm), & DL (210 x 99mm) in the angled pockets with ease, helping you to provide all the information you want to potential customers. Assembly of the entire stand is simple with the included tools, allowing up to despatch the brochure holder flat to keep shipping costs down, with the savings passed on to you. Order this elegant holder display for your real estate agency, shopping centre, retail store, bank, exhibition hall, or travel agency. Click here to see our online catalogue, with hundreds of different products in stock for you to choose from & order for your company. New items are added to our extensive selection weekly in order to stay current with the latest trends & styles! Slimline Warehouse has been providing high-quality goods at low prices for over 20 years! Orders paid prior to 1pm EST will despatch to Sydney, Melbourne, Perth, Adelaide, Brisbane, Gold Coast, Bendigo, & anywhere else in Australia same day with most in stock items!